I’m K. P. Alexander, an aspiring author. Check out the ‘About Me‘ page for more info. I’m currently writing my first series of books (AKA Episodes), of which four (along with a bonus short story) have been released so far. It’s a cross between fantasy and science fiction, leaning a bit more heavily toward the fantasy side. The title of the series is ‘Artifice’. When do you plan on publishing Artifice? The first two episodes, along with a special bonus short story, have already been published, and are available for free. Episodes Three and four are available for sale from all major ebook retailers. Check the sidebar for links to retailers that carry them. 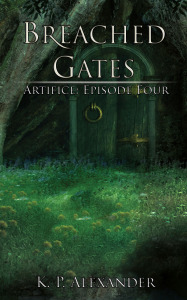 I am planning on publishing Artifice as an e-book serial rather than a traditional novel, in the hopes of drumming up interest as the series progresses. However, it should be noted that the episodes aren’t true serials. In terms of length, they lie somewhere on the midpoint between serial and novel. I know, I know. Serialized e-books tend to be frowned upon and passed over, as compared to full novels, since a writer can simply choose to abandon the project and leave their readers hanging and fuming. All I can do is assure all my potential readers that I am in this for the long haul. My reasons for serializing my work is simply to make sure that my readers will have something new more often, rather than having to wait for each full novel to be completed. How large will each episode be? The planned size was approximately 15,000 to 25,000 words per episode. However, that length proved to be too restrictive to tell a fun story that didn’t leave the reader hanging at the end. To that end, I changed the planned word count to 30,000 to 50,000 words per episode. Even so, Episode Two ended up clocking in at 54,000 words. What will the e-book be priced at? Artifice: Episode One will cost exactly zero dollars when it is complete, as will Episode Two. Episodes Three and Four are being sold at a competitive price of $2.99. Future books will probably end up at the same price point. But I’m poor/a student/in jail, and won’t be able to afford future episodes? If you have any circumstances that prevent you from being able to buy my work, contact me and I will gladly provide you with a Smashwords coupon for a free copy. I only ask that you not abuse this honour system, and if possible, tell a friend about my work. I have a question that’s not listed here. How do I get an answer? If have a question that you wish to ask me, either leave a comment below, on my Facebook page, or email me. How many books are you planning for the Artifice series? I’m really enjoying them, but get annoyed when a series runs into more than 5 books or so. Hi Mike – Truth be told, I’ve mapped out the storyline over a minimum of a dozen books so far. However, there will be multiple “arcing” storylines which I’ll be dealing with. Im about mid way through episode two at the moment, are there any plans to bring this series to life as a movie (animated or real life) and if so is there anything I can do to help aside from donating money? I would love to see this as on a screen with all the various characters and landscapes. I’m thinking of maybe shopping it around once I get Episode Five out, and then see what happens. So, crossing my fingers on that one. The only think I can think of is for you and all the other readers to spread the word far and wide. Tell your friends/relatives/parole officers about this great new series that you’re reading! I’m also thinking of implementing some sort of “thingy” where you can get a free copy of an episode by posting to your Twitter or Facebook page. More info on that in the coming weeks. Your welcome, and if you need any help with getting your work on the big screen let me know, I currently work for a theatre and have access to the projectors and software to make everything work nicely. I also have some friends with software for rendering and things like that if you need that kind of help as well. I have been telling my friends to at least check out your work cause I am thoroughly enjoying it. Again let me know if you need any help or anything, Im also thinking a TV series would be cool too. I can’t find episode 4, is it published?